Extraction: The essential oil is distilled from the selected gum-resin. Comments: Well known as an incense oil. Once in essential oil form, Frankincense can be classified into country of origin by identifying certain constituents. Aqua Oleum Pure Essential Oil, Frankincense 10ml - Traditionally a Christmas essence, but an excellent relaxant and de-stresser for all year round. Cautions: Do not take internally. Store away from children. Ingredients: Boswellia carterii. Its uses are diverse and include using in a burner or in the bath, a few drops to relax, aid asthma or bronchitis. 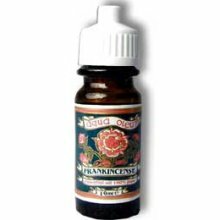 Frankincense can also be used with a carrier oil to massage into stretch mark. Great for expectant mothers' tummies. Safe for children. Usage: 5 drops to 10ml of base oil. Click the button below to add the Aqua Oleum Frankincense Essential Oil 10ml to your wish list.